And it appears that tomorrows Association results are already decided - without a game being played! 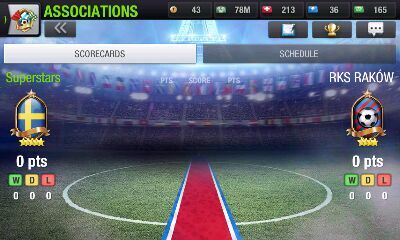 Our association had problems as well, seems like the update just made evrything worse. First leg went ok but on the return leg the game froze on us. Cant explain whats happeening but seems like if one or two matches are affected then the game freezes for everyone in the association. Have attached some screenshots hope it helps solve this issue. These are all taken during the second leg. Not in my Association - just finished the return Legs and based on the results in that, if we had a fair crack of the whip, we might have had a chance at qualifying for the Final - as it is, we're in the 3rd Place Play-off..
Really bad, Nordeus, really bad. Haven't been able to access any tab of the game since the association match started. Missing my Champions League match right now. Looks like it's time to leave association; the rewards aren't anywhere near the misery it's causing. Bunzo and madflo19 like this. 2 of my association matches are frozen right now. It's been frozen for hours and I have an important Cup match coming tomorrow morning, and if this doesn't get fixed I will miss it! Please help! I don't have a connection problem thank God, but I experienced other annoying bug. Problem is that when I have loanees they appear in my starting lineup no matter what changes I make to it before the match. That is I select my starting 11 players before the game, I confirm my selection, it says that changes were made successfully, but when I choose a starting lineup without the loanees, they reappear in my starting 11 when the game starts. I play on Android and Windows 10 on PC. Problem I think started last weekend, but reoccurred during all my 4 associations matches this weekend. Anyone else experiencing this thing? 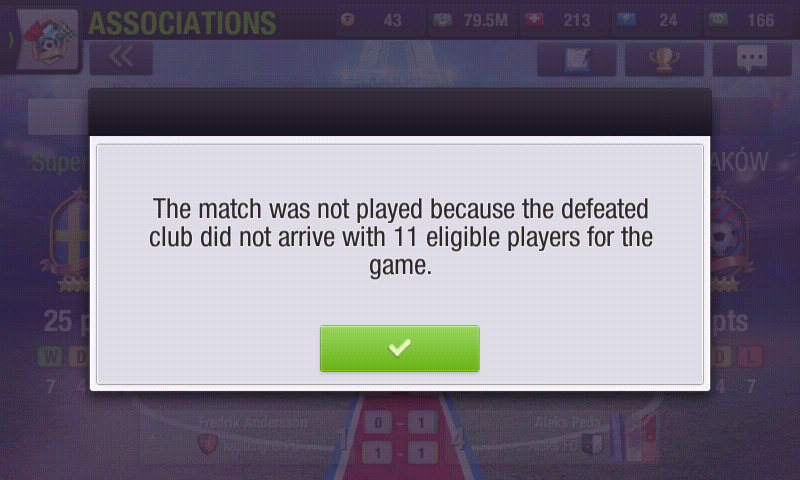 I hope Nordeus fixes this sooner, cause I lost some games because my starting 11 were not right. Wasn't able to check in with the finale. My status says now that my next match is 1 hour and 24 minutes AGO? Lol. The winner is already decided. 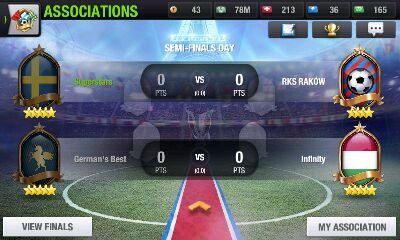 It is not my association although we were leading comfortably. I still can't check the status of the finale. There are still 4 games that need to be played but the finale is 1,5 hour ago. Strange stuff.